As a peasant stew, this dish has myriad forms, and typically would be adapted to the ingredients at hand. The must-haves are chicken and paprika—sweet paprika—and I guess it wouldn’t be too tasty without onions. 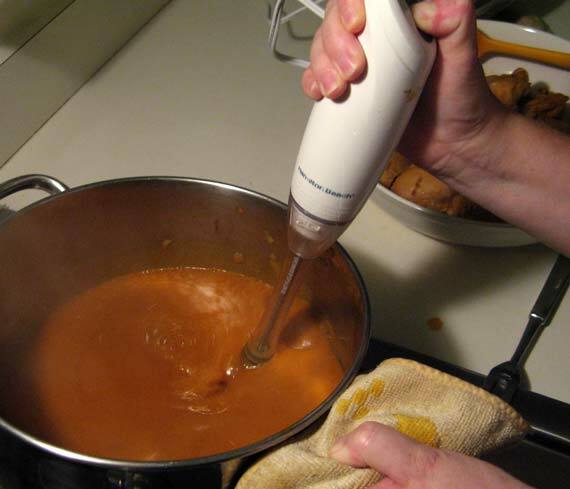 The liquid can come from water, broth, tomato juice or stewed tomatoes. Here’s my favorite variation of Fred’s Paprika Hendl. In a big cook pot, lightly sauté onions in fat (I prefer butter) until translucent. Add half the paprika when they’re mostly translucent, stirring so that the paprika blends throughout. Add the tomato product and the chicken, and simmer lightly covered for an hour (slightly less if you use boneless parts). Remove chicken to serving platter or shallow serving bowl. Mix the flour into the sour cream, and add it with the remaining paprika to the juicy mixture in the pan. Use stick blender to homogenize the mixture in the pan, then simmer it for 5 minutes so the flavors meld. Salt as needed. Add the chicken to the sauce in the pan. In a separate pot, prepare flat noodles (“egg noodles”), timing them so they’re ready when the sauce is ready. Drain the noodles and add them to the serving dish. Mix with some of the sauce to coat, then add the chicken and the rest of the sauce to the top of the noodles.